Crostwick is a small parish in the Broadland area of Norfolk situated to the west of Spixworth and east of Wroxham. The village name is derived from Scandinavian and means ‘clearing by the cross’. The village is mentioned in the Domesday Book when the land is recorded as owned by Ralph of Beaufour. 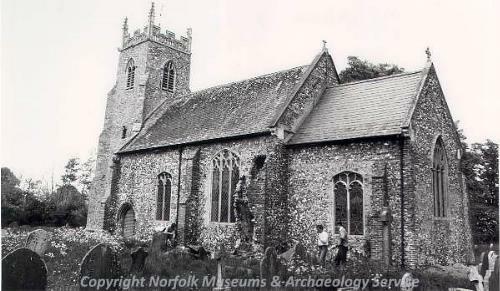 Although the parish is only small there is some interesting archaeology, especially identified from aerial photographs, but relatively un-investigated on the ground. The sites date from the Neolithic to World War Two. The earliest finds are two Neolithic flint axes (NHER 31371) found in the parish. A Neolithic flint site (NHER 8056) and a probable Neolithic long barrow (NHER 20477) have also been identified. A later Bronze Age ring ditch (NHER 29560) can be seen from aerial photographs. There is limited evidence for Roman activity in the parish, but some Roman pottery (NHER 24121 and 25279) has been reported and it is suggested that some Roman coins (NHER 24121) have also been found. The village is mentioned in the Domesday Book, and there is also archaeological evidence to suggest Saxon activity. A small amount of Saxon pottery (NHER 25279) has been found and metal detecting has recovered a Middle to Late Saxon strap end (NHER 25255) with an animal head and foliage decoration. The name of the village has been taken as evidence that there was a Saxon cross (NHER 8179) here too. St Andrew’s (NHER 8078), the parish church, was built in the 15th century. There are suggestions that settlement may have been more widespread during this period, and the deserted medieval village of Clare (NHER 12399) that is described in the Domesday Book is thought to be located somewhere within the parish, although it is not clear where. There have also been finds of medieval pottery (NHER 25279 and 34880) and medieval and post medieval metal objects (NHER 21481 and 28774) including a lead mould (NHER 28774) for faking coins of George III. The World War Two decoy airfield (NHER 13550) is a very interesting site. It was designed to defend RAF Horsham St Faith, and was so successful that it was bombed and a B52 attempted to land here! Features of the site can clearly be seen on aerial photographs. Although there are few archaeological records for the area it is clear that there was activity here from the Neolithic period onwards. The lack of records probably reflects a lack of archaeological research and recording rather than a lack of activity here in the past. Megan Dennis (NLA), 19 September 2005.